We have had a wonderful semester of music and sisterhood. A couple of weeks ago, we had our second annual Women Against Violence concert that benefited the Heal Charlottesville Fund. This concert celebrated the resources and community we have here in Charlottesville that are committed to fighting against injustice. 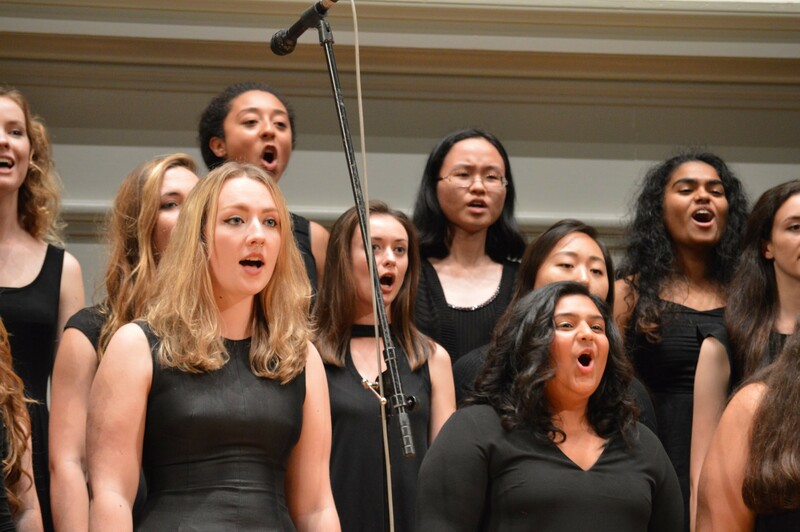 We had many singing groups from the UVA community join us, including various acapella groups, a group from a local Charlottesville middle school, and several community soloists. We hope that this concert helped to bring the Charlottesville community closer together, and we thoroughly enjoyed performing with all of the groups that participated. This past weekend, we performed in the Family Weekend Concert with the Glee Club and the USingers. During this annual concert, we sang four selections from our fall repertoire, including a collaborative piece. We loved having alumnae in the audience join us at the end of the concert for the UVA songs Ten Thousand Voices and the Good Old Song. We always look forward to joining our brothers and sisters in song and continuing this beloved tradition. We greatly appreciate all donations and support from our families, alumnae, and friends of the chorus. Your generosity makes all that we do possible and successful. We look forward to wrapping up this great semester with our annual Candlelight Concerts, December 1, and 2—we hope to see you there! P.S. : Here are some videos of our recent WAV concert! P.S., listen to us perform at the Family Weekend Concert!